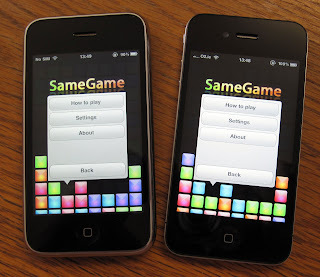 By now, most developers have got their hands on iPhone 4 and run their old iPhone apps on it. And I'd like to think that they, like me, are appalled at how terrible they look on the new Retina Display. The screen is just so amazingly sharp and vibrant that your artwork will look like crap unless you get it redone. Cue the sound of a hundred thousand developers' voices suddenly crying out in terror. Why? Updating your artwork for the Retina Display is a time consuming and expensive process. iPhone artwork often costs thousands of dollars to produce in the first place, and if you have to go back to your artist to get it all redone (possibly from scratch, if they didn't think to design with vector shapes) then you're looking at a significant cost just to get your app to a passable visual state on the iPhone 4. Those with in-house designers are at an advantage here, but for those of us who work alone it could well be a nightmare. My plan is to have Retina-Display-ready app updates as soon as possible. I have already redone all the artwork for SameGame myself (and it looks stunning, to be honest), and Grace and Speed will follow with minor updates (in that order). Lights Off will require huge effort, so as of right now I'm not promising any release dates (just as with the Universal update, there's too much going into it to give a timeframe). Hopefully you'll start to see the others soon enough. PS: That Retina Display is like nothing I've ever seen. It changes the way you view computer screens forever. You can never unsee pixels on other displays again. Developpers really need to update there applications, some icon look really ugly now on the iPhone 4. But I think that is just a question of time, and with the iPad + iPhone 4 Apple didn't give us a lot of time to redo our app. > For those developers who haven't yet seen their app running on a Retina Display, start freaking out right about now. Awww, c'mon now, the first rule is "Don't Panic"! This platform changes a lot, extremely rapidly. It's really hard to keep up in a small shop (saying this from personal experience), but I've found it's not so bad as long as you prioritize what's important and just keep at it. Haha, right on! I can't wait to get my hands on the iPhone 4 to see for myself. Two weeks! Fingers crossed.